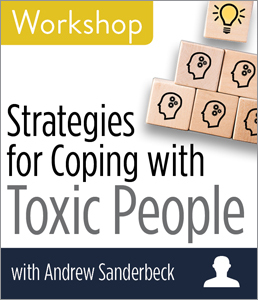 CHICAGO—ALA Publishing eLearning Solutions announces an exciting new workshop, Strategies for Coping with Toxic People with Andrew Sanderbeck. This workshop will last 90 minutes and take place at 2:30pm Eastern/1:30 Central/12:30 Mountain/11:30am Pacific on Wednesday, March 13, 2019. Whether they are patrons, co-workers, friends, or family members, toxic people can seem to defy our logic and understanding. Some are oblivious of the negative impact that they have on those around them, and others seem to derive satisfaction from creating chaos and pushing other people’s buttons. In almost every situation, dealing with toxic people can be very stressful. In this webinar, Andrew Sanderbeck offers you strategies for dealing with toxic people that will enable you to control what you can and eliminate what you can’t. You’ll learn that you are in control of far more than you realize. You’ll walk away not only with skills you can use in the library, but that you can use in life. Andrew Sanderbeck is an expert presenter, coach, and consultant for libraries and library organizations. His favorite topics include customer service and retention, effective communication, and management and leadership skills. He has presented at ALA, PLA, and at many state and regional library conferences, as well as international conferences in the United Arab Emirates and many European countries. Sanderbeck is the founder of PCI Webinars, a webinar company that produces 100 programs each year for library organizations. He is the author of The Power of Asking for What You Want and The ABCs of Positive Living.